The increasing demand for renewable energy continues to drive discovery in the Department of Electrical and Computer Engineering. Our faculty are leading projects in electric power systems, wind and solar energy, and energy planning that will help answer the challenges we face as a result of growing energy demands worldwide. 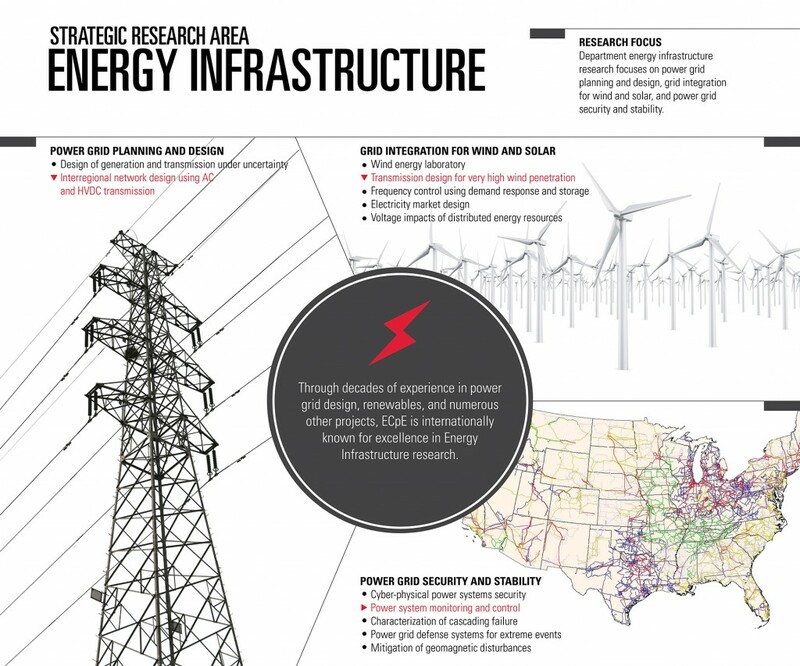 This research has applications in areas such as renewable energy, electric vehicles, and the smart grid. ECpE is working with Southern California Edison to create a set of coordinated, automatic measures to protect the Southern California power system against major disturbances. ECpE is a member of the Mid-America Regional Microgrid Education and Training (MARMET) Consortium, part of a $60 million Department of Energy project with aims to lower the cost of solar electricity and advance seamless grid integration. Engineers at ECpE are integrating distributed generation into the existing smart grid by designing networked, self-supplied microgrids that are more resilient to outages and safer from cyber attacks. For complete information on research projects and publications in this area, consult individual faculty members’ websites, our graduate student thesis archives, and individual research center and laboratory websites.